Gettleman says in that clip that 31-year-old Jonathan Stewart has “hardly lost anything.” It’s true that Jonathan Stewart averaged 5.1 yards per carry and caught 47 passes ... in 2011. But he hasn’t come close to that kind of production since, and he’s coming off a season in which he averaged a paltry 3.4 yards per carry, a career-low. We’re going to run. Oh, dear. 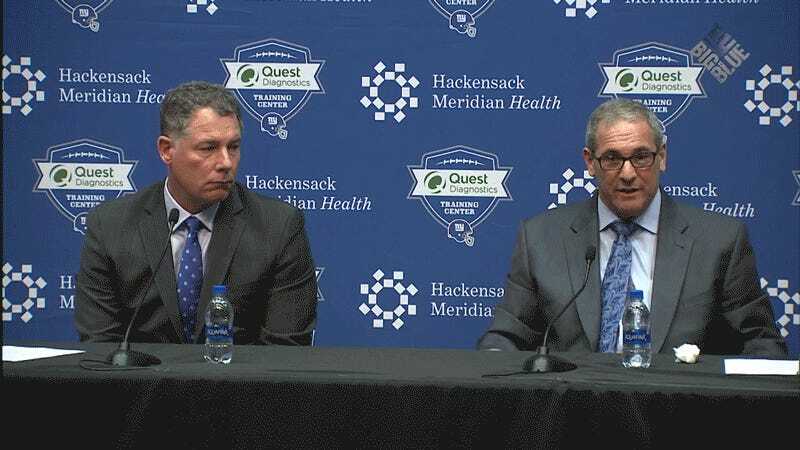 Was Gettleman committing to running the football, or did he mean he was eager to run that pick to the podium? Giants fans better hope it’s the latter. As Jimmy Kempski of Philly Voice calculated, the average age of a starting NFL running back is a mere 24.1 years. That’s not a particularly advanced stat. There are reasons running backs get paid less than kickers. There are also reasons impactful, dual-threat running backs like Le’Veon Bell, Kareem Hunt, Alvin Kamara, Dion Lewis, and Tarik Cohen have been drafted later than the first round. * Todd Gurley, a recent Top 10 pick, found himself last year largely because the Rams committed themselves to modernizing the way they use him. Barkley is a tremendous talent. He may even prove to be a generational one. But the only way the Giants will come close to getting enough value to justify taking him at No. 2 is by paying attention to what the analytics geeks have to say. Anyone want to tell Gettleman who won last season’s Super Bowl, and how they did it? Ray Lewis Says Odell Beckham Jr. Has "Removed God From His Life"